I was in the Twin Cities this weekend, having a lovely visit with Tom’s twin brother, his wife and girls. On Saturday I drove into St. Paul for a picnic sponsored by the Minnesota Historical Society Press (one of my clients). I got to have lunch with Brett Laidlaw and his wife Mary. Brett’s a fellow food blogger (Trout Caviar). I had the distinct pleasure of proofreading his cookbook of the same name earlier this summer. The MHS Press staff brought him an advance copy of his book to the picnic, so I got a sneak peek. Tom took advantage of having the kitchen to himself (Luke was at a soccer tournament) and made a double batch of lasagna. I don’t like to brag (lie!) but my husband makes the best lasagna ever. The Best Lasagna EVER. Tom’s been making lasagna since before I met him, and that was twenty years ago. He started with his mom’s recipe, and it would have been fantastic if he’d stopped there, since Mary’s recipes are reliably delicious. But Tom did what most good cooks do: he didn’t leave well enough alone. He tweaked and fiddled, added a bit here and there, until he got to the plate o’ heaven that is the current version. For a big, meaty dish, it’s surprising that the secret lies in the vegetables. He adds big chunks of zucchini and bell peppers (orange are always his favorite) along with the more expected onion and garlic to the tomato-meat base, and then cooks it until the sauce is very thick and the veggies have nearly — but not quite — melted into oblivion. When Luke was little and a picky eater, Tom would finely chop the veg so they would completely melt into the sauce; nowadays he likes to leave them in large chunks. Secret #2 is a pinch of brown sugar. It balances the acidity of the tomatoes without adding too much sweetness. A hefty dose of oregano adds herbal complexity. 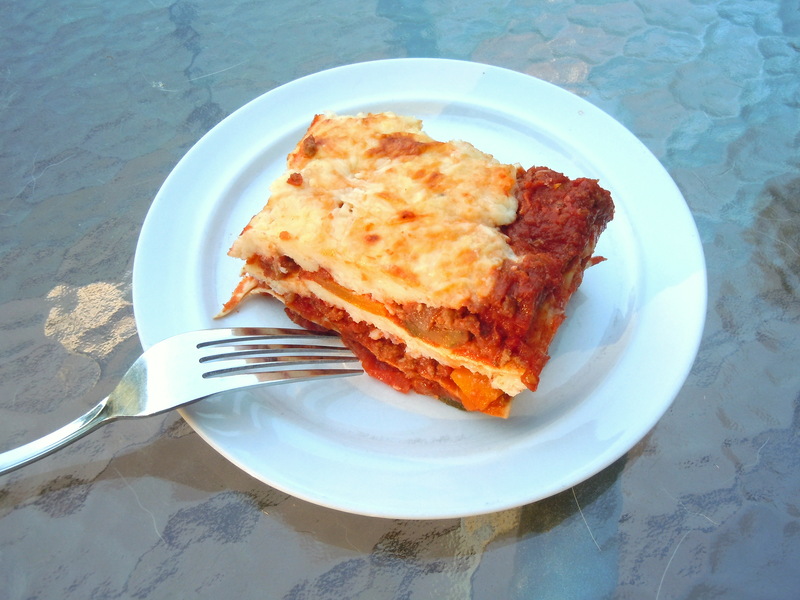 As with most lasagnas, his version is great the first day and even better on the second day. It also doubles and freezes just beautifully. Sometimes he makes extra tomato-meat sauce; we serve that over pasta with a salad and some parmesan-garlic toasts. 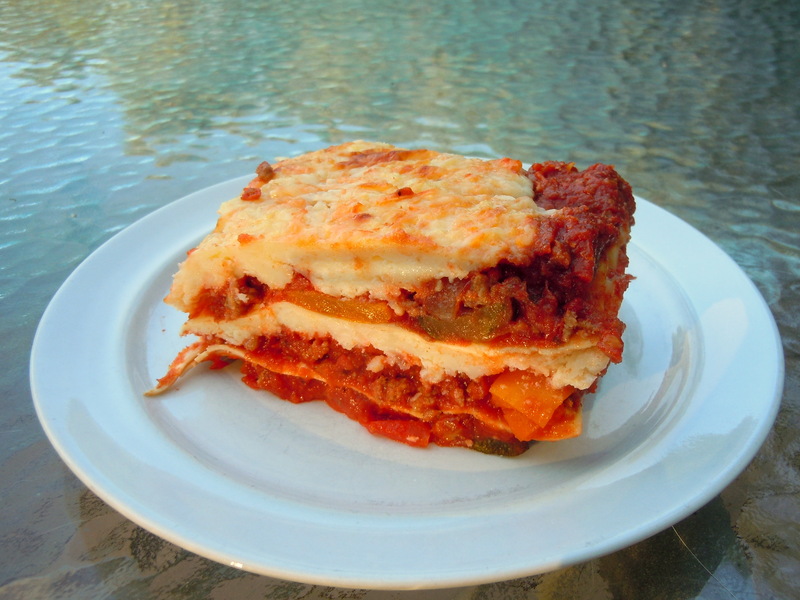 That super-thick sauce means that his lasagna is never runny. In a large stockpot, heat oil over medium-high heat. Cook onion, zucchini, bell pepper, and garlic until softened. Set aside in a bowl. Brown the ground beef in the same stockpot. Return the veggies to the pot; add the crushed tomatoes, tomato paste, salt and pepper to taste, herbs, and brown sugar. Stir well, cover, and turn the heat down to low. Simmer for about 45 minutes, stirring occasionally, until sauce is very thick. Heat the oven to 350 degrees F. Bring a large pot of water to a boil; cook the lasagna noodles for about 5 minutes until they’re mostly cooked but would still need about 2 more minutes. Run them under cold water and drain them well. While they’re cooling, stir together the ricotta and eggs in a large bowl until well mixed. Stir in 3/4 cup of the parmesan and all of the mozzarella; season with salt and pepper. Spread about 3/4 cup of the sauce in the bottom of a 13 x 9-inch baking dish. Tuck a layer of cooled lasagna noodles on top, trimming to make them fit if necessary. Spread with another layer of tomato sauce; there should be a little less than half the sauce left after you’re done. Top with half the ricotta mixture. Add another layer of noodles, the rest of the tomato sauce, then the last of the ricotta mixture. Sprinkle with the last of the parmesan. At this point, you can wrap it up really well and freeze it. Thaw it in the fridge before continuing as described below. Cover with foil and bake for 30 minutes. Uncover and bake for 15-30 minutes longer until the lasagna is hot and bubbly and browned on top. You can pop it under the broiler for a few minutes for extra browning, if you wish. You can reheat the whole thing, or reheat individual pieces, in a 350-degree oven for about 20 minutes. This entry was posted in main courses, pasta, rice, and grains and tagged casserole, ground beef, parmesan, pasta, ricotta, tomato sauce, tomatoes. Bookmark the permalink. Hey, Nancy, it was great to meet you at the picnic. Tom’s lasagna looks fantastic. I would love a big hunk of that right now–ravenous from picking apples and hauling buckets of them from one end of our property to the other! Brett, I enjoyed meeting you and Mary on Saturday as well. I’d FedEx you some of Tom’s lasagna (he made extra), but I’m not sure it would survive the trip. I hope you got a good harvest this year.